Ever been to a conference and found yourself constantly checking the agenda or finding out a little late that a change had been made? 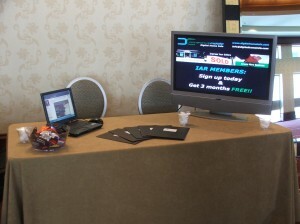 Between October 29 – November 1, 2008 we helped the DOCTRAIN East Conference with their mobile communications. We were part of the event’s daily communication strategy as well as providing a method for the conference to communicate last minute updates and changes to attendees. Attendees received approximately 5 text messages a day reminding them of sessions, lunches and special events. At the end of the conference 7 subscribers were randomly chosen via our system to receive door prizes from conference sponsors. We look forward to continuing our relationship with DOCTRAIN and providing them the same high level of service for each of their events. DOCTRAIN East is an annual Conference and the theme this year was Producing Quality Content. There were 275 attendees and presentations were given by many leaders in the Content Generation, and Document Management/Preparation software Industries. For more information on Content Management visit thecontentwrangler.com.